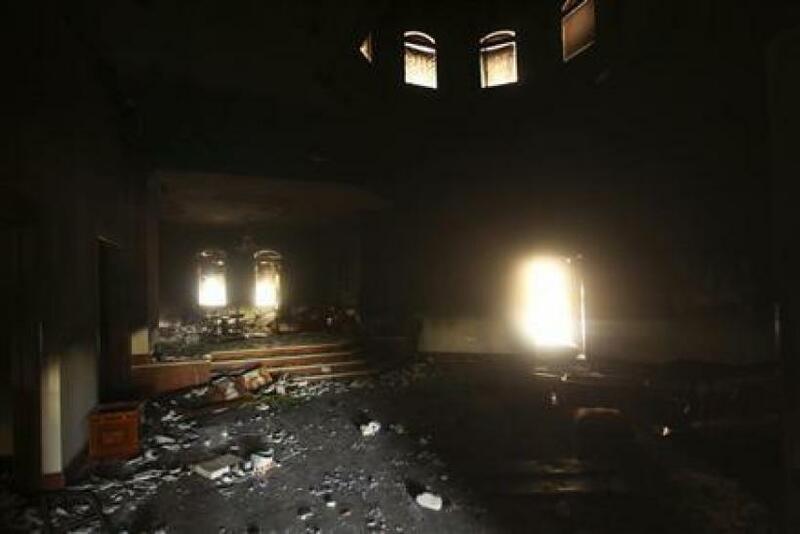 An interior view of the U.S. consulate, which was attacked and set on fire by gunmen, in Benghazi Sept. 12, 2012. Update 1:39 p.m. EDT: Khattala is not being sent to Guantanamo Bay; he'll be tried in the U.S. court system, according to Reuters. Obama previously said any terror suspect caught on foreign soil would would not face a military tribunal as part of his plans to close Guantanamo. The decision faced criticism by U.S. Sens. John McCain, R-Ariz., and Lindsey Graham, R-S.C.
"Obviously he should be put on trial. I'd bring him to Guantanamo. Where else can you take him to?" McCain said, according told the Washington Post. Graham said he wanted Khattala to be treated as an enemy combatant, which would mean he wouldn't be read his Miranda rights. "I hope we gather intelligence through the law of war interrogation," he said. "He should be going to Gitmo. ...It would be the biggest mistake for the ages to read this guy his Miranda rights. We should have some quality time with this guy, weeks and months. Don't torture him - but have some quality time." "The United States has an unwavering commitment to bring to justice those responsible for harming Americans. Since the deadly attacks on our facilities in Benghazi, I have made it a priority to find and bring to justice those responsible for the deaths of four brave Americans. I recently authorized an operation in Libya to detain an individual charged for his role in these attacks, Ahmed Abu Khatallah. The fact that he is now in U.S. custody is a testament to the painstaking efforts of our military, law enforcement and intelligence personnel. Because of their courage and professionalism, this individual will now face the full weight of the American justice system. "Even as we welcome the success of this operation, we also pause to remember the four Americans who gave their lives in Benghazi representing their country: Ambassador Chris Stevens, Sean Smith, Tyrone Woods, and Glen Doherty. As I said shortly after the attack, they exemplified the values that we stand for as a nation, including a commitment to freedom and justice. All Americans should be grateful for their service, just as we are grateful to all our personnel – civilian and military – who represent our country around the globe. We will continue to honor our fallen by carrying on their efforts in support of the Libyan people’s aspirations to live in a peaceful, prosperous, and democratic society. "With this operation, the United States has once again demonstrated that we will do whatever it takes to see that justice is done when people harm Americans. We will continue our efforts to bring to justice those who were responsible for the Benghazi attacks. We will remain vigilant against all acts of terrorism, and we will continue to prioritize the protection of our service-members and civilians overseas. We will also sustain our support for the Libyan people, as they work to overcome years of tyranny and do the difficult work of building a democracy." Update 11:53 a.m. EDT: Khattala is being held aboard a U.S. ship. He was reportedly blindsided by the raid, which was conducted without any U.S. casualties. "He didn't know what hit him," a source told Fox News. Khattala is reportedly the commander of Ansar al-Sharia, a Libyan Islamic militant group concentrated around Benghazi. One of the suspected ringleaders of the 2012 attack on the U.S. Consulate in Benghazi, Libya, which killed Ambassador Christopher Stevens and three others, was captured during a secret raid over the weekend, the Washington Post reported Tuesday. Ahmed Abu Khattala was captured by U.S. Special Operations forces working with the FBI near Benghazi in an operation that took months to plan, the Post reported. Khattala is in U.S. custody “in a secure location outside Libya” and was “en route” to the United States, but officials wouldn’t say exactly where he is being held. Khattala is the first alleged conspirator of the Benghazi attack to be apprehended. The Obama administration took heat following the attack on the consulate, with Republicans accusing the president and then-Secretary of State Hillary Clinton of not providing enough security for the building and not being forthright about what prompted the attacks. 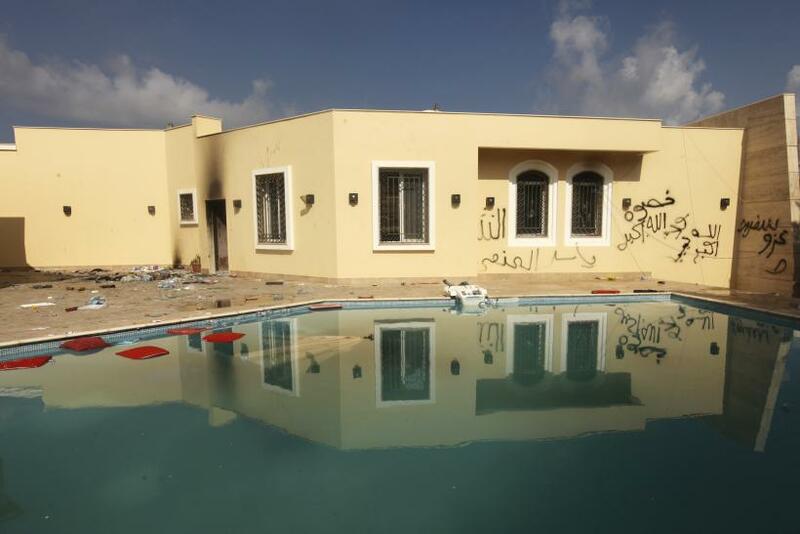 The administration also took heat for not capturing or arrested any of the alleged Benghazi attack plotters nearly two years after the incident.